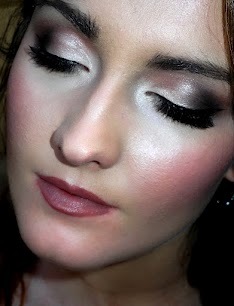 So here is the Oscars inspired makeup look that I have been working on! Use a primer to prime your lids (to make sure the makeup stays on all day long) and then take NYX jumbo eye pencil in Milk and apply all over the lid just up to the crease. (This will make your eyeshadow show up brighter and more true to color) Then take MAC's Nylon eyeshadow and apply that all over the lid as well. Then take MAC's soft brown and apply that in the crease of your eye with windshield wiper motions. Apply MAC's swiss chocolate to the outer corner of your eye. Then, taking a clean blending brush, blend all of the colors together so that none of the colors are too stark and unnatural looking. If some colors fade out too much, add more where needed. After that, apply Dior liquid liner starting from the middle of the eye to the outer corner. Let dry for a few seconds and then proceed to wing out your liner a bit. (There are great tutorials on youtube to teach how to do winged out liner but I will do a separate tutorial on that as well.) Then apply some thick coats of mascara for dramatic lashes! Line your lips with MAC's Beurre (you can follow your natural lipline or slightly overdraw your lips to make them look fuller) Then apply MAC's Half n' Half and blot with a tissue.